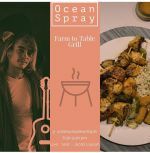 Ocean Spray Beach Apartments invites you to a Saturday Night Seaside Grill in their Mamus's Cafe. Enjoy a Farm-to-Table a la carte menu, ranging from Bds $45-60. Live music by Jacob Layson. Ocean Spray is on the Silver Sands beach front. Call 428-5426 or email info@oceansprayapartments.com for reservations.